New York-based fine jewellery brand Samer Halimeh NY has teamed up with yacht charter and sales broker SSH Maritime to launch a series of on board diamond boutiques for the 2017 Med season. Designed around a ‘Bond Street on the sea’ concept, the pop-up boutiques will appear on four of SSH Maritime’s charter yachts: Chakra, Serenity, Grand Ocean and O'Mega. 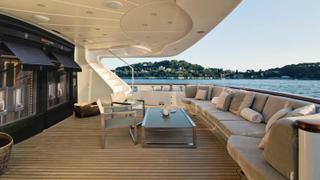 Prior to their charter vacation each client will be asked if they would like a diamond showcase on their yacht. Should they say yes they will be sent information on Samer Halimeh’s diamond portfolio in advance of their trip allowing them to select the pieces that will be exhibited on board when they arrive. All guests staying on the yacht will then be free to wear the jewellery at public and private events throughout their charter, both at sea and on shore when the yacht is moored, with the captain and crew responsible for overseeing the security and safety of the jewels. At the end of the vacation guests may select the pieces they wish to keep with payment due only once they have returned home. Depending on the pieces selected, prices will begin at around $6,000 and extend into the millions with those spending over $1 million eligible for up to three extra days free on board their chosen charter yacht.